After a gap of two years, the Berneray Causeway Trophy returns to Tarbert this Saturday. This competition will give youth players from both Lewis and Harris the opportunity to represent their islands whilst gaining competitive action against the visiting Uist side. 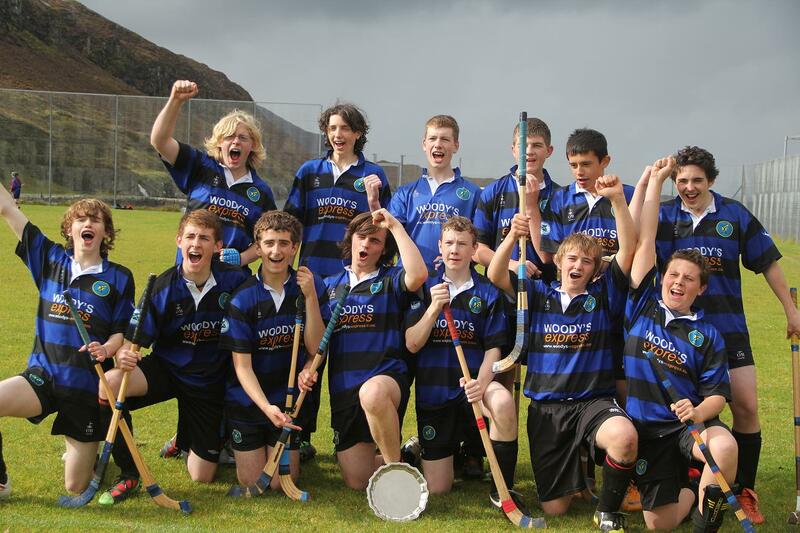 It’s great to see youth shinty really on the up in Lewis and Harris and hopefully either one of the sides will emulate the brave Lewis boys who saw off a well-fancied and experienced Uist team back in 2011. The Hearachs also did themselves proud that day, not conceding a goal in the whole tournament! It was a great morale boost for the club going into the Mod Cup and set us up for a clean sweep over the Uibhistich in 2011. Tha ceann-là ann airson coinneamh coithcheann bliadhnail Camanachd Leòdhais. Thèid an coinneamh a chumail aig Bun-sgoil Steòrnabhaigh aig 7f Diciadain 30mh den Damhair 2013. Thèid fàilte a chur air duine sam bith aig a bheil ùidh ann an iomain sna h-Eileanan an Iar dhan choinneamh sin. A date has been set for the Annual General Meeting of Camanachd Leòdhais. The meeting will be held at 7pm on Wednesday 30th October. All who have an interest in shinty in the Western Isles are welcome to attend this meeting. There will be a club committee meeting at Stornoway Primary at 7pm on Wednesday 25th September. Please send agenda items to Andrew MacAskill. A date for the Club AGM will be set at this meeting. Please pay any outstanding membership fees as soon as possible. Camanachd Cup Eve and Gary Innes and friends will be hosting a tribute to those shinty heroes of the World Wars who fought and died, and those who survived but were forever changed, in the Nevis Centre, Fort William. This is particularly poignant for any Leòdhasach or Hearach of course, as the decline of shinty in these islands was another marker of the devastating effect that the Great War had upon our people and our Gaelic language and culture. It is an immense source of pride then that almost 100 years on from the beginning of that most perverse and futile of wars that Camanachd Leòdhais has managed to bring the sport of the Gael back to these shores to which so many did not return. Involved as well in the event is shinty historian and great friend of Camanachd Leodhais, Hugh Dan MacLennan, and his Da Mhaide Dhireach presentation was highly regarded in its presentation when it visited Lewis detailing the history of Hebridean Shinty. As part of the concert, the Dubh is Gorm will be worn by Carloway’s Norrie ‘Tago’ MacIver when he performs alongside a fantastic line-up of musicians also wearing their home team’s shirt. Sure to be a great night and hopefully will be on BBC Alba soon. Gur math thèid leibh. Norrie has a lot to live up to in the Manran members stakes! 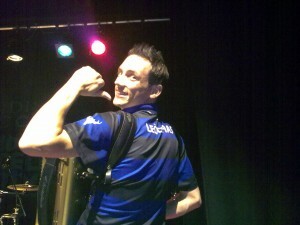 Here is a photo of Gary wearing the Dubh is Gorm way back in 2009 when playing with Box Club at the HebCelt. For a bit of fun after three full league seasons, and around only 18 friendly/cup/challenge matches between 2007-2010 (sixes tournaments not counted, but incredible to think we played more shinty in 2011 than we had in all four years previous combined), here is the “all-time” Camanachd Leodhais goalscoring charts. To qualify for this table you had to have scored at least 3 goals. 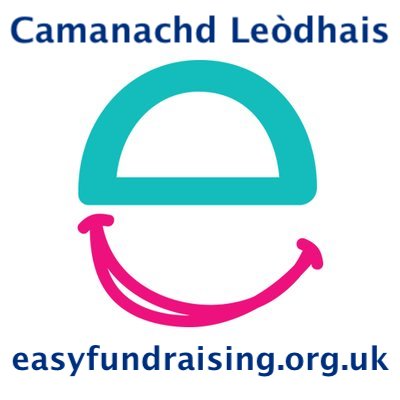 What is your favourite Camanachd Leodhais goal? Stompy’s opener against Beauly? Scott’s late equaliser at Strathspey? Duncan’s rocket against Cabers? Will’s winner against Uist in the Mod Cup? Answers on a postcard. The Bught Park has been the scene of several classic Camanachd Cup and MacTavish Finals, but the two bottom teams in North Shinty served up a game which was full of fight and drama on Saturday. It had everything, even that rare thing of beauty, a Donald Lamont goal. Donald put a season of bad luck behind him with a cracking strike on 20 minutes which was the highlight of a great performance from the Rubhach.We finished the first half in the ascendancy and if Will Church’s disallowed goal on 40 minutes had stood, the second half might have panned out differently. Needless to say, due to our seeming struggles to hold on to a lead this year, Inverness pegged us back every time we took the lead, as goals from Will were pegged back each time, the last with only moments left of the 90 minutes. The score 3-3, but with a superior goal difference to the Town, we remained above them and for the second season in a row we finished off the bottom. A great record for a club in only its third league season. Will’s brace also crowned him top-scorer for the season with 14, just pipping Duncan to the title but neither of them were complaining as Eoghan made good his three year old promise to buy anyone who got more than ten goals in a season a bottle of whisky, so it was two bottles of Black Bottle from the Hilton Scotmid for the lads. The Big Gaelic Teacher says next year it’s a bottle of whisky for anyone who breaches the 20 mark. In closing, the club would love dearly to thank the massive travelling support who came on Saturday, we are sorry we couldn’t secure the win for you, but you were definitely the 13th man/woman on the sidelines. The support of people from Lewis and Harris and beyond is so gratefully received and we hope you continue to support us into the future. 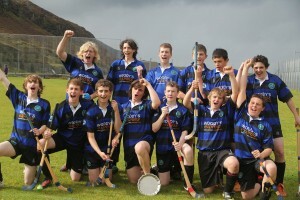 To paraphrase the Dark Knight, we’re the shinty club that Lewis needs, but not the one it deserves. One day we will be. One day we hope that a team in Dubh is Gorm will be gracing the Bught on Cup Final Day. In a week where we remembered one Morrison who was a great supporter and at the end of a season where we remembered another Morrison who was a committed player and trainer, if we can bring these qualities to bear over time then we can achieve this dream. There will still be training on Tuesdays and Thursdays and youth training is about to take a step up. Bring on 2014.